The Lioness Speaketh – Chasing Eleven, Chasing Life. I chose today to share with the world a conflict (having had to do some research for a graduate class) I have followed in SE Asia’s Myanmar, formerly Burma, after spending a semester abroad there in 2014. I feel the Western world completely disengaged, let alone aware or concerned in the least, with what is said to be the REAL MOST PERSECUTED GROUP OF PEOPLE IN THE WORLD. Hear this, see this, feel this…become acquainted with the actualities of strife and calamity plaguing a most beautiful nation in SE Asia. A country home to over 54.8 million people, with over 135 different ethnic groups and at least 108 recognized spoken languages, the country is diverse and likely one of the most vibrant and beautiful places on the planet. What looms within the newly formed democratic nation is not as pretty as the landscape and overall people present day. The country was under militant rule for years, shut off from the outside world until 2010. Like elsewhere in the world, an ongoing battle between two religious groups continues to fuel tensions, those over the course of nearly 80 years that have resulted in violence, massive numbers of deaths and exile of nearly 1 million people to neighboring countries since its beginning. Having spent so much time in scholarly study of Buddhist practice, history and belief, you imagine a majority group bonded by the tenets of non-violence and no harm to be peaceful, embodying a “Buddha mind”, hardly capable of significant violences against any person or groups of persons. Yet, this has not been the case within Myanmar for decades. With all the issues seemingly revolving around power, privilege and ethnic identities (somewhat an issue everywhere in various degrees of intensity), the most prominent conflict Myanmar is facing at present is the tension between the Rohingya people and Buddhist nationalists (some question/include the government) dating back to the 1940’s. Shams (2017) states Muslims in Myanmar are the “most persecuted communities in the world,” with thousands fleeing each year to predominantly Muslim border countries.” They are not officially recognized as citizens and have been subject to decades of violence and discrimination. 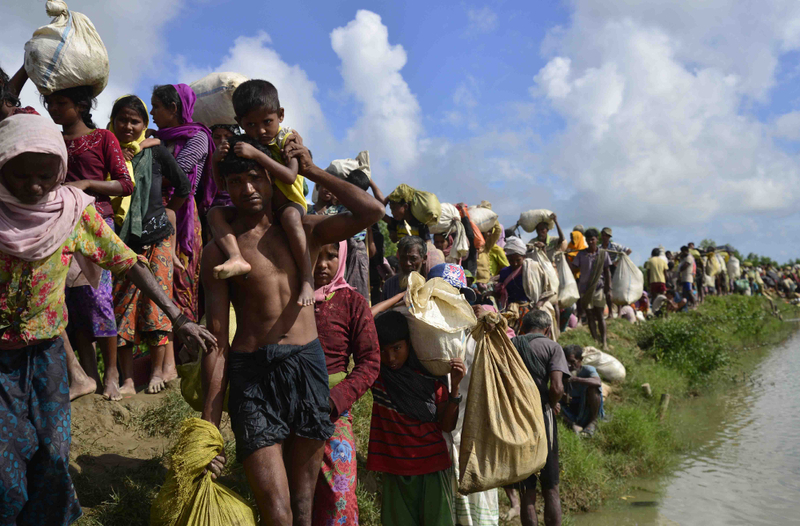 The Myanmar government has failed to regard the UN’s demands of 2014 for equal citizenship for the Rohingya minorities, states Shams (2017), resulting in the UN fearing a “humanitarian catastrophe.” Shams (2017) notes the government has failed to grant citizenship on the grounds it deems the 1.1 million Rohingyas illegal immigrants, and will reverse the its position only if the Rohingyas voluntarily identify as Bengali’s. This false identification is problematic since historically the group fled the once Burma in the 1940’s to avoid conflicts erupting from the Japanese invasion, making the Rohingya Muslims Burmese natives and descendants. After years of tension and outbreaks of violence between the Rohingyas and the country’s majority, most recently the violence has resurfaced in Rakine State. On August 25, 2017, Shams (2017) reports 100 Muslim insurgents attacked guards at security checkpoints in the border region of Bangladesh. Both sides accuse one another of burning villages and staging mass killings, with nearly 400 dead. There have been a series of ongoing conflicts ending in massive deaths over the past nearly sixty years of the historical tensions. As of today, October 14, 2017, Asrar (2017) states, “Myanmar’s government has said that nearly 40 percent of Rohingya villages had been targeted by the army in so-called “clearance operations”, with 176 out of 471 villages emptied of people, and an additional 34 villages “partially abandoned.” In an open letter to Suu Kyi from a displaced Rohingya Muslim, once in reverie of Kyi’s plight towards democracy for her people, Mayuu (2017) states, “What breaks my heart is knowing that we’re the most persecuted community in your – Aung San Suu Kyi’s – Myanmar…Now your name will be synonymous for the millions of Rohingya displaced around the world with the countless tyrants and dictators that have come before you.” As the conflict continues to escalate, the international community putting pressure on Suu Kyi to respond, refugees by the thousands daily cross over unsafe terrain and borders to safety on foot…the leader sits by silently, dismissive and indifferent, to what is an obvious attempt by her government at ethnic genocide and cleansing. Having spent time there, myself at a time in awe of Myanmar’s champion of the people and leader of the country’s National Democratic party, I have little recourse to understand Suu Kyi’s lack of humanitarian efforts to reconcile the people within her own country. The woman is more or less deified as a living goddess within her country and around the world for her prior efforts to move her country towards democratic rule and away from militant regimes. A political prisoner in her own home for over 19 years until 2010, Suu Kyi was not allowed physical contact with her husband, a London native, nor allowed to attend his funeral in his passing. Her own father was assassinated while she was a child, himself a national figurehead. She rose to power in against all odds, in country set forth with rules banning both women and rule by anyone intermarrying outside their country. She experienced her own exile, oppression, pain and loss, yet for some reason she sits by as a silent bystander to the ongoing violence and banishment of her country’s people, with numbers totaling more than a million since the 1940’s. The conflict itself, deeply rooted in religious difference, makes its ongoing nature hard to approach and dismantle. Although this in an ongoing conflict, far from resolved or being so, I imagine this lioness of a woman having the power to shift the dynamics, reunite her people in peace and forge new bridges going forward. Her voice is so deeply respected and renowned, I feel if she would speak and call for a laying down of arms, and return to a peaceful state, the people would adhere, even if in a slow process. The fact has said little to nothing, more or less failing to acknowledge her own government’s part in decimating thousands of homes and people, makes her directly responsible for the ongoing conflict. Not to decide, is in fact to decide. To see and do nothing implicates one in the worst way. Just a day ago, Suu Kyi finally speaks out in attempts to repair her reputation, announcing plans to “set up a civilian-led agency, with foreign assistance, to deliver aid and help resettle Rohingya Muslims in Rakhine state” (Wintour, 2017). I feel this is a positive step, beyond idle and violent complacency, yet she must move to reconcile the hearts and minds of the people beyond simple aid/relief and replacement. If Suu Kyi could remind the people of their interconnectedness, as suggested by Sawatsky (2008), of her own with the Rohingya people, how sacred their lives and communities are, the people could come together to forge the kaleidoscope of culture which makes the country the most diverse and vibrant in the world. If she help them to focus on their unique particularities, recognizing the importance of their differences while embracing their commonalities of heart, the people may stop fighting. Using a relational approach, focused on a care response for the people, like the methods noted in Sawatsky’s Justpeace Ethics, Suu Kyi could use her position and voice to facilitate unity and concern for the broken relationships throughout history, and help them imagine ways to rebuild going forward. Justice and peace are rooted in a centralization of “self, community and ‘the other'” in relationships (Sawatsky, 2008). If Suu Kyi could be accountable to the enormous responsibility she has to the people, reminding them of their own for one another, she could reinstate compassion in the hearts of a people once united together against the very type of oppression that once governed their country and subjugated them as a whole. Sawatsky (2008) notes, “If we live as if our neighbors don’t matter, they will suffer greatly…for if our neighbors suffer, we suffer.” With a recognition of the interconnectedness of a people, of all of life, responsibility for such ensues. Taking responsibility for the conflict as it persists, helping the people as a whole to be accountable for its history, is the way to achieve peace going forward. Yet, when you have a leader who blatantly looks away, even as pressures from global leaders continue, the idea of responsibility seems a far cry to a majority who feel justified in the crimes against humanity they continue to inflict. Why do I care? Because being displaced is something I know to the depths of my core. It is the experience that both buries you in hopelessness, and shows you the magnitude of your own power to rise again. They will rise again. We will rise. The lioness in us all shall take the world by surprise and remind it how powerful she can be. Asrar, S. (2017). “Rohingya crisis explained in maps”. Aljazeera News. Retrieved October 14, 2017. http://www.aljazeera.com/indepth/interactive/2017/09/rohingya-crisis-explained-maps-170910140906580.html (Links to an external site. )Links to an external site. Mayyu, Ro (2017) “Open letter from a Rohingya to Aung San Suu Kyi.” Aljazeera News. Retrieved October 14, 2017. http://www.aljazeera.com/news/2017/10/open-letter-rohingya-aung-san-suu-kyi-171014082728040.html (Links to an external site. )Links to an external site. Sawatsky, J. (2008). Justpeace Ethics: A Guide to Restorative Justice and Peacebuilding. Eugene; OR: Cascade Books. Shams, S. (2017). “The Rohingya people in Mynamar: What you need to know” (2017). DW: Made For Minds. Retrieved September 10, 2017 from http://www.dw.com/en/the-rohingya-people-in-myanmar-what-you-need-to-know/a-40340067 (Links to an external site. )Links to an external site. Wintour, D. (2017). “Aung San Suu Kyi unveils relief plans for Rohingya Muslims.” The Guardian. Retrieved October 14, 2017. https://www.theguardian.com/world/2017/oct/13/aung-san-suu-kyi-unveils-relief-plans-for-rohingya-muslims-myanmar (Links to an external site. )Links to an external site. Thank you to the lioness in you for reminding us to awaken her in ourselves for the good of us all! There are several families in my neighborhood that are Chin Myanmar refugees. Them sharing their stories of atrocities further fueled my desire to stand up for those whose voices so often go unheard…..